Situated in a superb hilltop location with spectacular views, Casa Asolo is very close – a leisurely twenty minute walk - to one of the loveliest villages in Italy. The charm of Asolo has attracted many intellectuals and artists, including Robert Browning, Igor Stravinsky, Ernest Hemingway, Eleanora Duse and Freya Stark. The village is part of the national circuit of 'Citta del Vino' (Cities of Wine) and its fabrics and embroidery, hand-painted ceramics and antique furniture clearly represent the Asolan handiwork. An antiques fair is held on the second Sunday of each month. Surrounded by the ancient towns of Padova, Treviso and Venezia, Asolo is a perfect choice for an unforgettable holiday. The beautiful scenery, medieval walled towns and Palladian villas blend into the magical landscape and will transport you back in time. 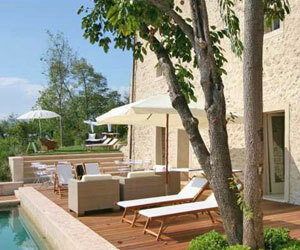 Casa Asolo is newly restored to take full advantage of the breathtaking, panoramic views. This renovation artfully combined existing elements of the past with contemporary comforts. With three double bedrooms, all with en suite bathrooms, it is the perfect getaway home for three couples. The living room and bedrooms are air conditioned and the outdoor areas are arranged so the spectacular views are not compromised. The terrace is furnished with lounge chairs and provides the perfect spot to relax and dine. Outdoor lighting illuminates the property and the pool in the evening giving an ethereal glow. Enter into a spacious, inviting living room with a working fireplace and comfortable furnishings. French doors open to the terrace and swimming pool. The adjacent dining area has a square table with seating for eight guests and the modern, large kitchen is fully equipped and has a beautiful ancient table. A guest bathroom is next to the kitchen. A staircase of sixteen steps takes you to the first floor. Here are two double bedrooms, both with en suite bathrooms with showers and south-facing windows overlooking the garden. The laundry room is also on this floor. Stairs with fifteen steps lead to the second floor. The master double bedroom is on this floor and has direct access to a private terrace and the upper garden. Its fabulous bath suite has a large Vicenza stone tub and separate shower. The terrace is furnished with lounge chairs, umbrellas and dining table. Both the terrace and the heated pool have magnificent views of the valley and are illuminated at night. *The three double beds each have a bed frame with two mattresses. Guests who prefer not to sleep together may request the mattresses be made up with single bed linens. Not suitable for those with walking difficulties and children under 8 years of age.